Episode 21. 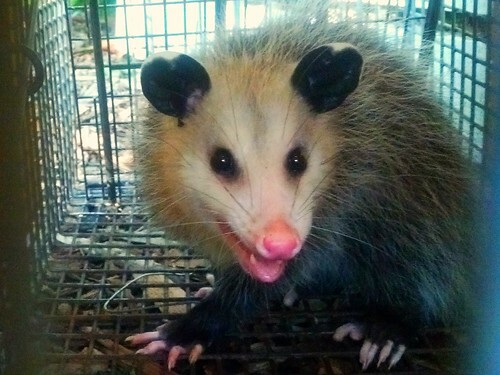 In trap #2 we catch a smaller, much angrier opossum. When I look at him he weaves back and forth and bares his teeth at me just like we are playing basketball with a lot of money at stake. He must be angrier because he is younger. It’s rebellion. Episode 22. We decide to stop naming our vermin as there are so many of them. Episode 23-24. Two entire days with no new developments. I (wrongly) start to think that the era of wildlife trapping is coming to a close. Episode 25. 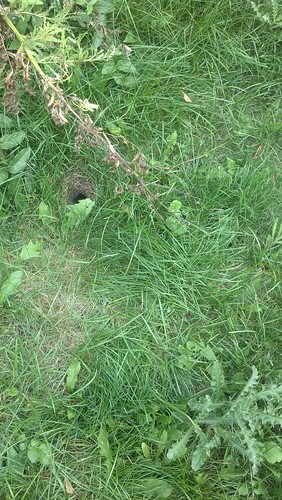 We discover a nest of yellow jackets near one of the traps. That explains the rotting fruit / radon guy attack in episode 1 of this blog post series! Closure for a sub-plot = excellent narrative arc. Episode 25-a. I read that in mild climates, yellow jacket nests can be quite large, such as this one that is the size of a Chevrolet. In Michigan they are normally the size of a basketball and hold 3,000 (!) yellow jacket workers and one queen. That worker number seems too high to be correct but it is in the Tuscaloosa News so it must be true. Episode 26. Trap #1 caught a Chickaree! I like how he has no regard for gravity. Episode 26-a. Chickarees are called Chickarees because of the noises they make, but they are also known as Red Squirrels. Although in this photo above this one looks sort of like what I think of as a “normal” (Fox) Squirrel, actually Fox Squirrels are much bigger. (And they are silent.) This Chickaree is tiny — the size of a chipmunk. I’m not sure how he even triggered the trap. Episode 26-b. Here’s a surprise. Whenever I looked in this cage he leapt at my face. Pretty bold for a creature that weighs less than half a pound. Episode 27. The Critter Control guy tells me that Red Squirrels / Chickarees are “fierce.” OK, he did leap at my face, but “fierce“? Really? 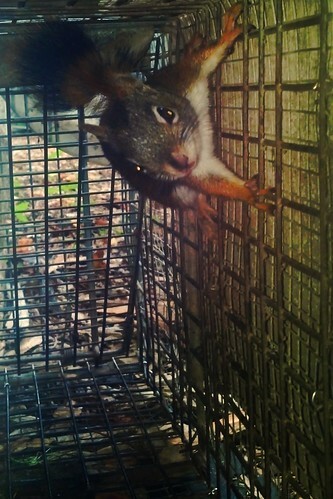 Then Mr. Critter Control opened the cage and let the cute little guy out. Believe it or not, the Chickaree immediately jumped to a nearby tree while loudly making his Chickaree noise, he then started fighting with a much larger Fox Squirrel right in front of us. They wrestled a while, then the Chickaree chased the Fox Squirrel off our property at about 120 mph. Fierce. The Critter Control guy gave me a meaningful look as if to say, “See?” But he didn’t say anything out loud. Episode 28. What a busy day. 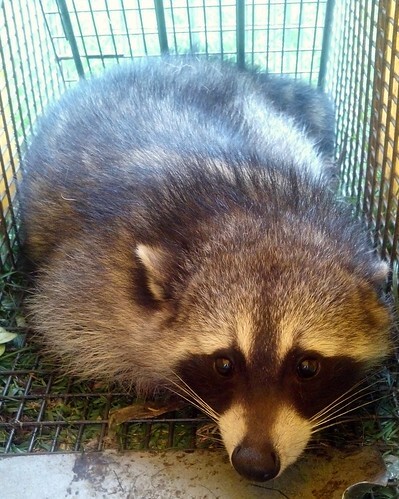 Trap #2 catches a raccoon. He is just about the cutest thing anyone has ever seen. The Critter Control guy advises us that we should just let him go. Raccoons are smart and not afraid of people. They don’t dig burrows and they don’t usually chew things. They occasionally eat your garbage if you leave the can open. They could try to shelter under your porch for a while to have some babies, but that is rare. This raccoon looked quietly at us when we were near him but as soon as we moved away he would start trying to pick the lock on the cage with his tiny paws. At least that is what it looked like he was doing. Then when he saw us looking at him he would stop and put his paws under himself and stare at us. I felt like a correctional officer. Episode 29. When we let him go he sauntered slowly out of the cage and then after moving a little way away from us he stopped and stared back at us for a while. Maybe he felt that he was owed an explanation? For this treatment? Episode 29-a. I noticed that he did eat the apple. Episode 30. While we are standing in the yard after letting the raccoon go, amazingly, he comes back and stands on our side porch. He will not be cowed. We walk over to him and he retreats to the front porch where he goes under the step but then sticks his face out to look at us. As if to prove we are not really scaring him. I guess we have a new pet. Episode 31. The Critter Control guy put insecticide down the yellow jacket nest for us and doesn’t charge us “because we have been such good customers.” That’s right. We’re getting volume discounts from the pest control guy now. That tells you something about our situation. Continue to Part 4 of this series. This entry was posted on Sunday, September 2nd, 2012 at 12:40 pm	and is filed under Groundhogs, Living. All those nice things you said about raccoons are true unless you have a dog door. Then, watch out for raccoons!